Photo taken on rocks south of Junipero Sierra Peak in the eastern Santa Lucia Mountains © 1999 John Game. A red polygon indicates an extant occurrence. Sandstone cliffs and outcrops (Vaqueros Formation) in chaparral or foothill woodland, commonly with Castilleja foliolosa; 585-740 m.
Subshrubs 1–3 dm tall, 1–4 dm wide, stems slightly spreading to erect, tomentose, grayish to reddish; leaf blades linear to narrowly elliptic, 5–20 mm long, 1–4 mm wide, the margins revolute, white-tomentose below, less pubescent and more greenish-gray above; involucres solitary and sessile, 4–6 mm long, ribbed and with 5 teeth; inflorescences cymose-umbellate to cymose, rarely capitate, tepals glabrous, 3–5 mm long, perianth tawny-yellow to rose, the base not stipate (Reveal and Rosatti 2013). Relatively novel in habit and appearance and not readily mistaken for any other species in our region. The Indians, Los Padres National Forest (Monterey County). Endemic to central California in the eastern Santa Lucia Mountains (Monterey County). Stephenson and Calcarone (1999) estimated only 65 acres of occupied habitat, but field surveys are not complete over large areas of suitable habitat. Perhaps only a few thousand total individuals total are known in four occurrences (CNPS 2010). A 2013 survey connected to the CNPS Rare Plant Treasure Hunt found one of the occurrences to be in excellent condition. The relationship of this species to other species in sugenus Eucycla is uncertain (Reveal 2005). Vulnerable to minor impacts associated with hikers on the Junipero Serra trail. CNPS, Rare Plant Program. 2010. Eriogonum butterworthianum, in Inventory of Rare and Endangered Plants (online edition, v8-02). California Native Plant Society, Sacramento, CA. http://www.rareplants.cnps.org/detail/732.html [accessed 6 February 2015]. Reveal, J. L. 2005. 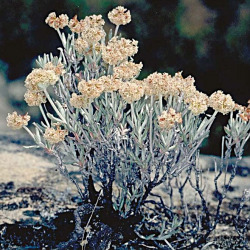 Eriogonum. In: Flora of North America Editorial Committee, eds. 1993+. Flora of North America North of Mexico. 18+ vols. New York and Oxford. Vol. 5. http://www.efloras.org/florataxon.aspx?flora_id=1&taxon_id=250060210 [accessed 6 February 2015]. Reveal J. L. and T. J. Rosatti. 2013. Eriogonum butterworthianum, in Jepson Flora Project (eds.). Jepson eFlora, http://ucjeps.berkeley.edu/cgi-bin/get_IJM.pl?tid=24720 [accessed 6 February 2015]. Stephenson, J. R. and G. M. Calcarone. 1999. Southern California mountains and foothills assessment: habitat and species conservation issues. General Technical Report GTR-PSW-175, Albany, CA. http://www.fs.fed.us/psw/publications/documents/gtr-172/gtr-172-cover.pdf [accessed 6 February 2015].